Here is a simple, healthy and delicious recipe with broccoli taking center stage. Enjoy! An active compound in broccoli called sulforaphane not only helps the detoxifying efforts of your liver and skin cells, but also helps protect and repair sun-damaged skin. The barbecue sauce adds a zesty, smoky sweetness that complements the broccoli surprisingly well. Using a stainless steel pan for cooking vegetables allows them to retain all of their vitamins; nonstick cookware and glass cookware can actually cause vitamins to leech out. Combine tofu, parsley, lemon juice, water, and ¼ teaspoon salt in a blender or food processor. Blend until smooth; set aside. In a skillet, over medium-high heat, add oil and onion. Cook for 4 minutes, stirring occasionally. Add broccoli, remaining salt and pepper. Cook 4 minutes, stirring occasionally. Add barbecue sauce; continue cooking 2 minutes or until thickened. Spoon broccoli mixture evenly over bottom halves of muffins/ Top with tofu dressing and muffin tops. Any sweet onion will work. Try Walla Wallas and Vidalias; both are specialty onions, and both are occasionally eaten out of hand! Seasoned rice wine vinegar can substitute for the lemon juice; it is a little milder and smoother than lemon juice, and good by itself as a dressing. More healthy eating on Healthin30. What’s your favorite smart healthy recipe? Please share them with us in the comment section below. As always, thank you for your very valuable time. John La Puma, MD is the leading physician voice for healthy eating as part of health, and a wellness, ethics and lifestyle expert. Both a board-certified practicing internist and professionally trained chef, he is a New York Times best-selling author, REFUEL and CHEF MD Big Book of Culinary Medicine, and co-author of Real Age Diet. He hosts PBS’ ChefMD® Shorts and PBS Specials on diet and fitness, and serves on the Board of the Food Bank of Santa Barbara. He is the first physician to teach a cooking and nutrition course in a U.S. medical school (SUNY-Syracuse), with Dr. Michael Roizen of the Cleveland Clinic. 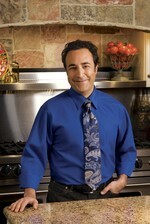 Dr. La Puma specializes in weight management in Santa Barbara’s Chef Clinic. To learn more, please visit Dr. John La Puma, MD. Thank you Dr. La Puma for sharing this great recipe!